This planter does not have a bottom. It is designed to sit on the ground and be fixed to a structure such as a fence or an arbor. This cold frame project is uncomplicated to build and uses wood and glass pane. This box is the latest addition to the tourney gear we usually bring to events. 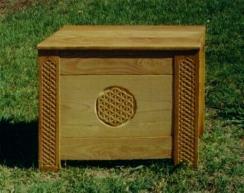 Its not a strict reproduction of any particular box, but rather a combination of two styles.